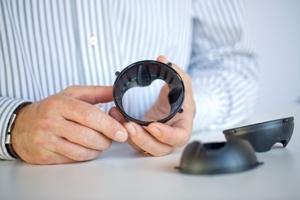 One of the world’s leading suppliers of automotive micro-actuator systems for various kinds of adjustments has chosen Arnite® A, a high performance compound based on polyethylene terephthalate (PET) from DSM for use in its latest generation of exterior mirror adjustment units. The material outperformed several rivals in a series of qualification tests. Magna Auteca required a replacement for PBT, which improved the durability performance for this new application. As a result of this, the company looked at a wide range of compounds based on different engineering thermoplastics. The validation period at Magna Auteca lasted over a year, during which time the company put the materials through a wide range of tests. Magna Auteca, located in Weiz, Austria, has now selected Arnite AV2 370XT, a 35 percent glass reinforced PET specifically intended for applications with extremely narrow tolerances. The adjustment unit, code-named MR5, will first appear on the latest version of the Porsche 911. “Arnite XT outperformed PBT, PA66, PPA and competitive PET products on every single test, due mainly to its high dimensional stability, high stiffness and strength, and excellent wear and friction properties,” says Michael Kleinhappl, Design Engineer at Magna Auteca. He adds “in addition to providing a top-quality material, DSM also provided best-in-class support throughout the entire application development phase”. DSM’s family of Arnite XT grades all offer extremely good dimensional stability due to its low moisture absorption and a very low and constant coefficient of linear thermal expansion (CLTE) that is comparable to aluminum. Arnite XT tolerates a wide range of temperatures and environmental conditions, including chemical exposure. DSM is able to produce Arnite XT to very narrow specifications (glass fiber content, for example, is specified to 35.0 +/- 1.0% versus a minimum 2.0% margin in competitive products), ensuring an unprecedented consistency from batch to batch to fulfill the demanding requirements for high performance precision parts.